This past week, my wife Sarah gave so much of herself that I was simply amazed, even though it’s just par for the course for her. She gave me a long hug and a pep talk when I felt down. 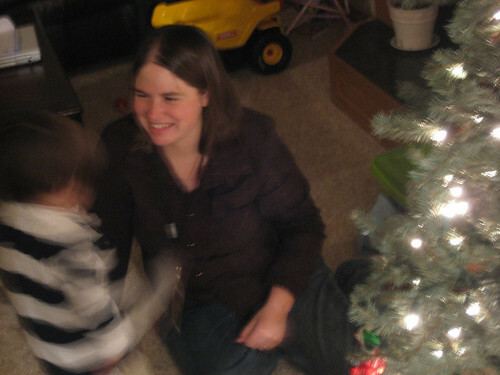 She played a seemingly endless game with Dragonball action figures with our son. She scheduled an entire day to spend with a person who wanted to “shadow” her at work to learn more about teaching. She calmed our infant son in the middle of the night when he had an earache. She prepared an amazing meal plan for two different sets of houseguests. She picked out a perfect faucet to replace our broken one in the children’s bathroom. She held our daughter after the little one woke up from a bad dream. She’s a whirlwind of energy and ideas and wonder in my life, every single week, and most of them involve giving of herself to others. It’s a daily inspiration just to try to keep up with her. Regardless of the long term outcome of what happens in Egypt, I am always awed by the power of a large group of people who work together with a common voice. Something needed to change, and the people there have certainly caused change. I hope that the future holds a positive outcome for the people and nation of Egypt, but regardless of what happens, the determination of the people in Cairo is impressive. Straus was a Chicago investment banker in the early twentieth century who was an enormous proponent of being thrifty as a tool to improve your financial state. Here, he sums up something I’ve been feeling about frugality for a long time, that it has more to do with your character than anything. If a person has enough backbone to avoid all of the temptations of modern life and spend significantly less than they bring in, then that person is probably worthy of attention. Mondrian’s art is something that I never really “got.” I would see it in art galleries and art books, look at it, shrug my shoulders, and move on. 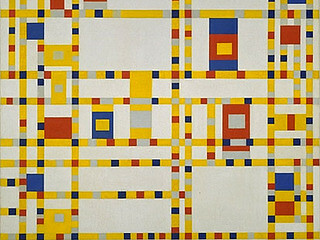 One of my old friends, though, is a huge fan of Mondrian’s work, using it as her avatar on various social networking sites. Recently, she switched her avatar to this one and, for some reason, it just clicked with me. There’s something about this painting that seems very alive to me, like there’s a huge amount of energy right under the surface, like I almost expect the lines to start moving because they’re holding back so much energy. Given the title – which I didn’t even realize until recently – I think that’s what the painter intended. In my opinion, the single biggest challenge of being the parents of young children is the lack of sleep. Between our five year old, our three year old, and our baby (who currently has an ear infection), most nights are interrupted by crying, a bad dream, a wet bed, or something similar. This, of course, can result in some awfully tired parents during the day. I’ve truly come to appreciate good nights of sleep and I know that on days after I sleep well, I tend to amp up the productivity, focusing on getting things done above all else. A good night’s sleep makes all the difference. It’s worth noting that every person we think of as being great at something alomst always had to work what we would consider to be an insane amount at it to become great. Malcolm Gladwell estimates that the time investment for greatness is 10,000 hours of practice. The thing that always comes to mind for me is that Kobe Bryant’s offseason workouts require him to make 1,000 baskets. Not attempt. Make. Every day. That’s why I’ll never be as good at basketball as Kobe, but I can certainly be inspired to work harder at the things that do matter to me. Simone Dinnerstein is the pianist who recorded one of my favorite albums of the last several years. This short interview of her (mixed with pieces of her playing) covers a lot of interesting topics at once. My favorite part was her noting that becoming a parent caused her to wake up in regards to figuring out how to use her musical gifts and passions as the basis for a career. I strongly identify with that sentiment, though there are many other interesting elements going on here. Over the past week, I’ve started the first baby steps of teaching my five year old how to play chess. This has been a very enjoyable experience thus far, but I’ve been grasping for ways to teach anything beyond just how the pieces move. So I went to Youtube, and I found the wonderful videos of chessvideos. This is exactly the kind of thing I’m looking for when teaching my son some of the nuances of chess. He largely understands how the pieces move around. My challenge is to keep him interested via enthusiasm and also help him to feel like he’s improving but do that in a way that he understands. Many of the concepts of this video are still over my son’s head, but such videos have helped me greatly as I teach my son and keep him excited about using his mind. For those of you who don’t know who Peter Lynch is, he had perhaps the single best run as a mutual fund manager of anyone ever during the 1980s. He managed Fidelity’s Magellan Fund from 1977 to 1990, earning a 29.2% average annual return during that period. Simply put, he’s probably the best stock picker of the modern period. Lynch directly says that the best stock pickers get only six out of ten picks right, and that much better than that is flatly impossible. To find someone even that good – good enough to get six out of ten right – you have to search, have a lot of money to invest, and have some luck, too. On the other hand, you could just easily get five out of ten by investing in an index fund – and pay a lot less in fees, to boot. I love how the best stock picker of them all makes a pretty solid case for not putting your money with stock pickers. My great piano teacher, Diana Helmer (who really needs a website of her own! ), helped me make several breakthroughs on my piano solo of this song. Over the last few days, I’ve just been returning to the keyboard over and over to master the parts I now understand.